Think the AirPods look too minimalistic? Look, we get that the trend recently has been towards headphones that do away with as much excess bulk as possible (just look at Apple’s recently released AirPods as a prime example). But if you want to go in completely the opposite direction then we might have found the perfect pair of headphones to let you do just that. After all, what’s more excessive than attaching a full on helmet (complete with eyes that light up) to a pair of headphones? Well that’s exactly what Hasbro has done with its Guardians of the Galaxy 2-inspired helmet. 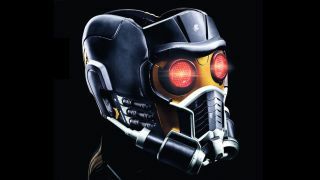 The helmet is modelled after the version worn by Star Lord in the movie, and is adjustable so it can fit both adults and children. We’re not expecting the headphones to actually sound any good, but for $100 this looks like it might just make the perfect costume accessory. Currently in the prototype stage ahead of a release in time for this year's movie, we'll let you know how our mixtapes sound on this thing as soon as we get our heads in one. For a more sensible pair of wireless headphones check out our guide to the best wireless headphones.